How to store energy has become as important a challenge as how to generate it. The types of batteries that power our electronic devices or vehicles are tried and tested, but they're not suitable for really large-scale energy storage – the sort of batteries that can power whole communities, key emergency services and critical infrastructure. Making the jump from small to large capacity batteries that could provide back-up for the national grid in times of high demand has proved difficult. Lithium ion batteries offer high power density in a compact size and have many uses, although concerns have arisen about their potential to cause fires. Engineers usually encase the battery in a fire-proof cell, but this eats into the battery's lightweight advantage. One technology focused on meeting large power needs is the redox flow battery, with Ronke Power, launched at the Dalian Institute of Chemical Physics in China 12 years ago, a leading player. Like other batteries, a redox flow cell contains electrolyte solutions and a positive and negative terminal, around which electrons flow when the circuit is connected. If the battery is not charged, the electrolyte gradually loses its stored energy. How the redox flow battery differs is that in order to maintain energy, fresh electrolyte is continuously pumped into the battery. The battery, or converter as it is called, is supplied with positive and negative electrolyte solutions held in separate plastic storage tanks. When the electrolyte solutions are supplied to the converter, power is instant and can be varied simply by controlling the flow of electrolyte. An important advantage of redox flow is that it's relatively low-cost. The converter stays the same size for a given power density, but the duration power can be extended from four hours to more than 12 hours simply by installing larger plastic storage tanks to hold more electrolyte. 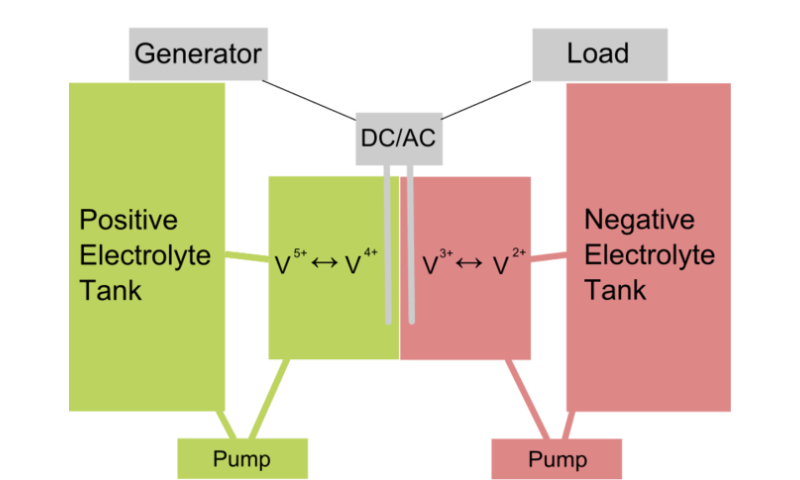 The electrolytes' charge can be regenerated through connection to electrical power to reverse the discharge process – in other words, when mains power is connected the tanks charge, and when mains power fails the tanks discharge as back-up. These are both practical and economical batteries. Several types exist such as zinc bromide, polysuplhides, and zinc-cerium, but it's vanadium-based batteries that are now most common, for a number of environmental and cost considerations. A drawback compared with lithium ion batteries is the energy density – the size of the installation is large, although I see this as a positive way to differentiate those uses below 20MW (small, lithium ion batteries), and larger installations of redox flow batteries providing 20MW or more. Several changes are occurring that make the need for high-capacity energy storage more pressing. Globally, people are moving from rural areas into cities, concentrating the population in smaller areas and placing greater strain on the energy grid. This means that any disruption has a greater impact and is felt by more people, with an economic impact from the effects on industries such as aerospace, petrochemicals, oil and gas, and engineering. Another change is the surge in renewable energy generation, part of the jigsaw that will ensure sustainable, reliable and competitive energy production into the future. Booming installations of wind and solar generation have brought about a pressing need to integrate these irregularly generating energy sources into the grid. It's particularly obvious, however, that wind energy generated overnight when power demand is low is wasted. If wind farms had proper energy storage systems, this energy could be stored until it was needed, meaning the capital invested in wind farms could be more fully used, something which could double the power generated. Other systems could also benefit, such as municipal waste systems based on anaerobic digestion of organic waste into methane gas. This natural process continues around the clock, so if power was generated from gas continually and linked to energy storage it would provide the same benefits. Building an energy storage system that's high-capacity and financially viable is key. With suitable storage, which can be anywhere in the grid, we have practical use of intermittent renewables. I used to think it was progress poco a poco, but now I see a rapid acceleration of programs.